Craft beer is still booming. Yet despite growth, the industry has maintained its state of dire racial representation. This month, a small collective of black entrepreneurs have made it a priority to take flip the conversation by proving that not only do their people enjoy beer, but they can brew the hell out of it too. Founded by Ed Bailey and Day Bracey of Drinking Partners Podcast and Mike Potter of upcoming site Black Brew Culture, Fresh Fest hits Pittsburgh August 11. Bringing together the best black brewers on the scene and pairing them with great music and local food, the event seeks to open eyes while making the idea of a beer fest, well, fresh. To get intel on the groundbreaking event, Thrillist contributor Ale Sharpton hooked up with co-founder Potter to talk about the fest's origins of the idea, the status of Pittsburgh’s beer scene, and how more people who look like him -- as well as other minorities -- can further populate beer bars, festivals, become brewmasters, owners, and show the world craft beer is appreciated by everyone. Ale Sharpton: How did you initially get into craft beer? Mike Potter: "I initially got into craft beer around 2000, but my first beer ever was Budweiser. Just seeing different brands pop up in restaurants and bars got me eager to start exploring different tastes other than what I had been drinking up until then. "I was really digging Sam Adams and Sierra Nevada, along with Anchor Steam. Then in 2005, I was on a bike ride and discovered a small brewery that was literally three blocks away from my house. At that time, I had never seen the inside of a craft brewery and thought all beer was made in some massive vat in a giant warehouse in Milwaukee. [Laughing.] This brewery had a sign on the door of their hours, which were like Tuesday and Thursdays from 4-9 or something. I eventually found out they all still had day jobs! "I looked down at my watch and it just happened to be 4:30 and a Thursday, so I locked up my bike and walked in. Thirteen years and several great friendships later, we brewed our first collaboration, For The Culture, with Scott [Smith] and Brendan [Benson], the owner and brewer of East End Brewery, for Fresh Fest!" What is the beer scene like in Pittsburgh and where do you usually frequent? Potter: "The beer scene here is real dope. There’s a great sense of camaraderie amongst the brewers in pretty much all of Western Pennsylvania, and you see a lot of local collaborations for beers, venues ,and actual events. Pretty much everyone is down to help the next guy out and are very supportive of each other’s projects. Right now, I’m really into 11th Hour, Brew Gentlemen, and Hitchhiker. Allegheny City and my girl Meg at Rock Bottom are also really starting to stand out too." When did it become a serious idea to conceive Fresh Fest? Potter: "Shortly after I did my first podcast with The Drinking Partners here in Pittsburgh, I met up with Day Bracey to discuss how we could do more with our platforms in the craft beer industry. After being involved with the first Harlem Beer fest with my good friend Celeste Beatty and helping with a couple of other festivals locally, I started visualizing what a black brew festival could possibly look like; and that was one of the first ideas I pitched to Day at that meeting. "I felt the timing and energy was right and Day was immediately on the same page. We both had similar but different networks and we both were very passionate about the current state of diversity in the craft beer industry, so it was sort of the slam-dunk idea." Why the name, and what makes it different from other festivals? Potter: "On a national level, Fresh Fest is all about shedding light on people of color in the craft beer industry and exposing their talents and brands to a broader audience. On the local level, it’s about introducing brewers and breweries to the community, and creating opportunities that might not have existed prior to those introductions. "We wanted to get as many people involved as we could, so we came up with the format of breweries and local talent working on new beer collaborations to kind of get a conversation going. What that conversation was about was totally unique to each partnership, and that’s been the beauty of putting this festival together. We were totally hands off with after the initial connections were made, and that allowed these convos and relationships to develop organically through the beer. "As for the name, to us the word 'Fresh' covers so much ground when it comes to craft beer and black culture. A little throwback reference to old school hip-hop, while also referencing the best time to consume most beer. We let our creativity flow with everything about this festival and it’s going to be an epic situation that people will remember for a long time to come. "The first thing you will notice that stands out from other beer festivals is that there will be a whole lot more brown faces in the crowd. Another great thing about Fresh Fest is that for almost all of the people in attendance, they will have never tried a single beer that’s being offered. I’m talking 70-plus brand-new beers that will be available, which is pretty dope." "It’s a 3 billion dollar-a-year industry and I see no reason why we all can’t have a piece of the pie." Can you discuss the Fresh Fest’s collaborations and how they formed? Potter: "We tried to align brands that we knew had the most in common with the brewer or brewery, so the conversation would be easy to start. There’s no better way to begin a dialogue than to have mutual interests and things in common. For example, Barrett Tillman of BlackMan Brewing teamed up with local brewery Grist House. With Barrett having his own sours yeast company, plus brewer and owner Kyle Mientkiewicz being heavily into brewing kettle sours, the match was a no brainer. I swung by on their brew day when Barrett was in town and the energy between them was truly something to watch. I couldn’t keep up with all the science they were dropping, so I had to tap out after about three or four hours. 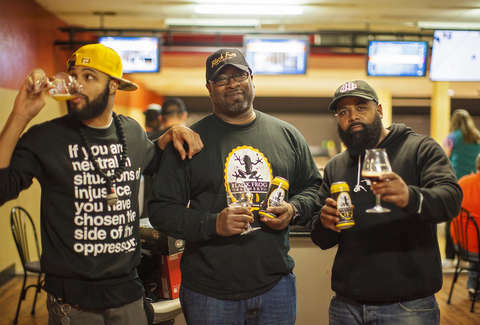 "As for the black-owned breweries visiting us nationally, it was just a matter of calling on some great people doing some great things, and asking them to get down with something really monumental to the craft beer scene. Initially, I reached out to people I had worked with in the past to kind of give us the foundation. Chris Harris of Black Frog; Reggie [Jones] and Rod [Dotson] at Rams & Parrots; Kofi [Meroe] and Amado [Carsky] of Sankofa; Ray [Berry] up at White Lion; and Kevin [Blodger] at Union Craft. With their enthusiasm and commitment, we were able to get others on board who we hadn’t necessarily established relationships with but were excited about what we were trying to do. All in all, it’s been a great experience building something that is long overdue in this industry." Why do you think there aren't many minorities or people who look like us imbibing craft beer, and how will you help change that? Potter: "Well, there are plenty of us out here bro! [Laughing.] But I agree, on the grander scale, the ratio is very uneven. It just comes down to exposure and access, man. As with most of the social and economic imbalances in this country, we’re dealing with a situation that [originally] started decades, if not centuries ago. "The reason most black folks don’t know much about craft beer is because the marketing and access to alcoholic beverages were limited -- targeted even -- to certain products beginning in the 50’s and 60’s. In the early days when big beer marketing was more of a thing, all you saw in the advertising of beer to the black community was cheap and poorly produced products that were designed to get you fucked up quick for as little money as possible. Still to this day, that’s how many of us make our drink purchase decisions. "In fact, take your question and flip it like this: 'Why do you think there aren't many white guys or people who don’t look like us imbibing malt liquor?' The answer is the same. Never once has there been a heavy marketing effort towards white people to drink Colt 45 or St. Ides, so it’s not something they inherently consume. You just don’t see whole coolers dedicated to malt liquor in Trader Joe’s and Whole Foods." What do you hope will happen with Fresh Fest, what are you looking forward to, and what are your future plans? "Besides just having a really good time and drinking some kickass beers, one of the major things we discussed is establishing the official Black Brewers Guild over the weekend once all of the brewers are in town. After Fresh Fest is in the books and the magazine goes live, we’re just looking to establish a hub and a platform for empowerment and diversity in the industry. It’s a $3 billion dollar-a-year industry and I see no reason why we all can’t have a piece of the pie." For more information, visit freshfestbeerfest.com. Thrillist contributor Ale Sharpton is a journalist and scribe specializing in beer. Read his work -- including the full version of this interview -- at his official site and follow him @AleSharpton.